A comfortable lightweight mat ideal for three-season use. Strikes a good balance between comfort and weight. I ordered this using Massdrop, though once I paid taxes (forgot about that!) I paid the typical price for this in the UK. It is suitable for three-season use. I would not use it in temperatures hovering just above or below zero, the cold would penetrate. It is suitable for side sleepers. 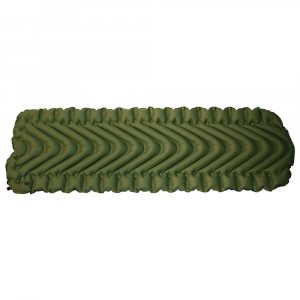 I used it on the South Downs Way long distance path and it is now my sleeping mattress of choice. I have a lighter more compact Sea to Summit mattress, but for a little extra weight the increased comfort thanks to the deeper chambers is more than worth it. I am a side sleeper and many of the campsites I used were quite lumpy. Despite this, the mat was thick enough or me to sleep on my side without feeling any lumps or the ground (usually, I can feel the ground under my hip with other mats). On inspection it feels and looks well made using a durable material. The claim is that the V shaped chambers reduce airflow and thus retain more heat. I found that I could feel the cold in single figure temperatures after moving, but soon after the temperature was acceptable as the air in the mat stabilised so I think there is some truth in this. The mat is rectangular which suits me as occasionally I need to change ends if I am on a slope and cannot sleep on the side I prefer or I can feel the blood going to my head during the night. It is a simple matter of spinning round whilst still in my bag—not something that can be done with a mummy shaped mat, so the few extra grams and bulk are worth it. The mat was comfortable and I got a good night's sleep thanks to the generous depth of the chambers. Inflating it did not take as many breaths as I expected thanks to the v-shaped design which reduced the amount of volume needed to inflate it fully. The valve took a little a little bit of thought, but the instructions are printed on it so it was easy to figure out once I had read this! I would have preferred a valve that does not protrude as it makes rolling it back up a little more tricky and it catches easily. My only gripe with the mat is the bag it comes in. Like most outdoor products that require a bag to be stowed in, they never make them quite big enough so it would be challenging and frustrating if cold and/or tired. Overall, this mat strikes the right balance between weight and comfort. It packs small enough for it to be stowed in my bag used for multi-day hikes. 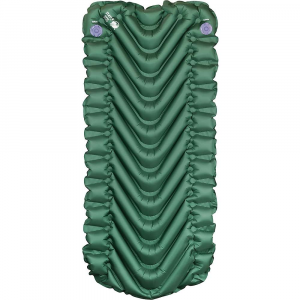 It is suitable for side sleepers and three-season use provided a decent sleeping bag is used in conjunction with it. I highly recommend it. Thanks for the review, Oliver! Do you have any pictures of your Klymit pad you could show others in your review? Found it online after a friend told me about getting one at Costco. At first I was worried because the price was so much cheaper than other name brands. Wow, does this pad perform. I move a lot at night from back to side and so forth. It is comfortable no matter what position I choose to sleep in. I enjoy the tiny compact package it becomes when not in use. The addition of a patch is a nice thought, but it seems very durable. I am 6' and over 200 lbs and have had no problem with this pad. I typically use a ground sheet or am in a tent. I would use any of the inflatables on bare ground. In the winter here in Alaska I typically put a closed cell foam pad under my inflatable for extra insulation. The Klymit pad works great and I don't notice any cold spots. It also fits nicely in a hammock. The only problem I have had is that the valve can be a bit tricky to get open in the mornings. It's a push and turn type opening and sometime it doesn't want to open. You have to hold the bottom part while pushing down and turning with the top. I guess I am just use to the typical screw type valves, but in over 20 night out it has given me no other problems. One last note, the baffling on the side seems a bit higher, so I haven't had any problem with rolling or slipping off the pad. Welcome to Trailspace, Warren! Thanks for sharing a review of your Klymit pad. I hope it continues to work out well for you. Please keep us posted! Thanks for the review. How cold have you taken this down to? Very disappointed. I used this once and returned it. I used this once and returned it. We were car camping, because I know better than to backpack with new sleeping gear. The temps dropped and we woke to frost and ice—had to be in the 20s unexpectedly (forecast said something else entirely). I had to get in the car in the middle of the night. As a quilt user I found that cold air just goes right in the channels underneath me. The second night I borrowed a fleece blanket and it helped but the deep channels were just a tad too uncomfortable, as I move around a lot in my sleep and I'd wake up as I bottomed out through the pad. Even if it weren't unexpectedly cold, I doubt I will be comfortable with Klymit —none of them are "cush" enough for someone with old hips. I tried this one because it seemed to have more to it than the ones with holes, thinking it might be a good summer option. Not making that mistake twice. Thanks for the review, Lori. Is this the uninsulated version? Nope, I made sure it was insulated. I had the same issue with Klymit's hammock pad. Read the part about it being a "heat sink" https://www.trailspace.com/gear/klymit/insulated-hammock-v/#review37294 Using a quilt may be a part of it for both of us. As the member of another website, I get to periodically test out new camping products in exchange for a review and got to play around the with the Static V2 on a recent backpacking trip in north Georgia. Overall I was really impressed with how lightweight and comfortable the pad was along with how small it packed up in my bag. One issue I often have with camping pads is that you have to sleep on your back without moving or you hit pressure points that make it uncomfortable. It was a completely different experience with this pad. I moved around all night, not because of the pad but because that's how I sleep, and every position I was in felt comfortable. This was so nice after a long day with a heavy pack on. I would highly suggest checking out the Static V2 for your next camping trip not only if you are backpacking but also for any form of camping. This pad was super easy to use and I liked the design of the inflation valve. You just twist then pull to open then push and twist to lock it closed. It was easy and quick to get it completely inflated and it gives you the ability to make minor adjustments to how full of air the pad is. It was also very comfortable to sleep on and I was happy on both my side and back. The V pouch design really does work to cradle your body and reduce pressure points while sleeping. In terms of durability, I didn't get enough use to really assess this but the pad has a lifetime warranty and comes with a lightweight repair patch kit so I can imagine it is built to last. The materials also seemed to be tough and would have no issues if used directly on the rocky ground. The one major negative to this pad is that it has a lower R value but for the size and weight this is not surprising. 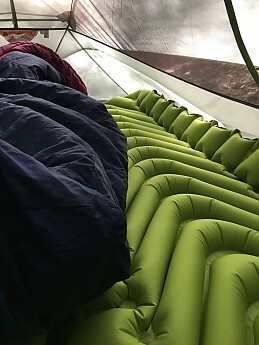 It was also designed in such a way to take advantage of the fill in the sleeping bag and enhance the insulation already provided. 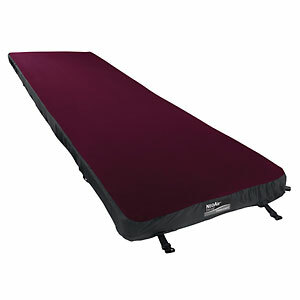 My experience sleeping on the pad was very enjoyable and I would highly recommend it. Thanks for the review, Asher. I hope you'll let us know how the Klymit pad holds up. 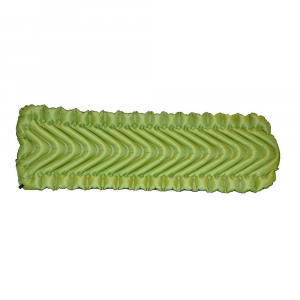 Comfortable lightweight sleeping pad at an affordable price. Bought this pad as a replacement for a self-inflating one. I had to get something that packs smaller. It's pretty comfortable, made well, and I find it to be a better value than other brands. The Static V2 is very easy to inflate, taking only a few breaths to get it at a comfortable level, though the baffle design makes it a bit tricky to deflate. The baffles themselves are comfortable and don't make it feel like you are sleeping on a pool toy, and the 25-inch width is great since I move around in my sleep a bit. I have found that it slides around too much on top of a Therm-a-Rest RidgeRest pad, but that can be fixed with a little velcro tape. The air cap is a bit tricky to use, wish it was a bit more simple like the Therm-a-Rest ones, but I don't see it as too much of a negative given the cost. I've used it both car camping and backpacking and number of times and it's holding up just fine, no signs of wear and tear yet, though I'm not especially hard on my gear. Great sleeping pad for sure. This inflatable sleeping pad was a great pad. The V shape in the center position makes my body feel relaxed after a long hike. The V also makes sure my body doesn't slide down when I have to build my tent in the sloping campsite. To inflate this pad I need about 10-13 breathes and it does not make me exhausted. Klymit Static V2 weighed about 13oz/462g. It's slightly lighter than the predecessor Static V that weighed 18.1oz/514g. This pad is very light and I love it. The pack size is only as big as Nalgene standard 32oz bottle, really great for my 55l backpack. While I am on the way to the mountain on the train I put this pad in my backpack's side pocket so I can easily get this pad. In my country, Indonesia, this Static V2 pad price ranges Rp800-Rp900 ($60-$70), so it is a great price for me, a university student. Cost-to-value of this pad is awesome for me. After the pad inflated you must push down and turn the valve clockwise. It's slightly hard to turn the valve. You must find the right grip so you can turn the valve. And for me this only the con. 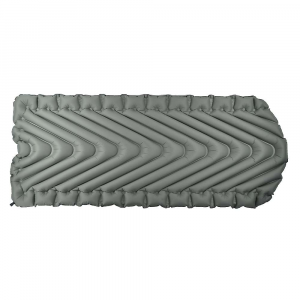 So, with the money spent for sleeping pad for the quality of the Klymit Static V2, I think this is a great sleeping pad, for sure. Thanks for sharing your Klymit review, Rifaldi.